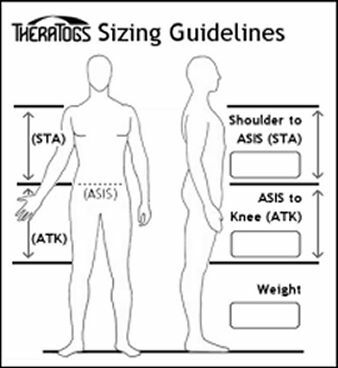 TheraTogs™ ULTRA: The Next Generation in Therapy You Wear™ - Made with NEW GoldTone™ fabric! Nearly ten years ago, TheraTogs changed the rehab landscape with ‘wearable therapy’ – allowing clinicians to send their hands home with an adaptable and dynamic garment-and-strapping system. We’ve changed the game again – with TheraTogs™ ULTRA, the next generation of TheraTogs neuromotor training systems that correct functional and postural alignment with limitless repetitions during daily activities. In addition to several design and configuration improvements, TheraTogs ULTRA products are made of GoldTone™ — a unique, high-performance knitted fabric designed specifically to meet the demands of TheraTogs systems. Those new to TheraTogs will find GoldTone garments easy to use for immediate results; experienced “Toggers” will find that GoldTone’s stretch, rebound, and recovery are even better than the previous blue TheraTogs material. The classic TheraTogs ULTRA Full Body System improves postural alignment and stability, and addresses the greatest variety of functional alignment and movement issues. Designed for children with complex neuromotor disorders, the Full Body System enables a limitless variety of integrated trunk and upper/lower extremity applications. A sleeveless TankTop split into front and back segments for easy donning in standing, sitting, or supine positions. Extremity cuffs in two sizes. An assortment of elasticized straps of different shapes and stiffness. Double-Gripper hook-with-loop material; use this material to make replacement tabs that serve as attachment sites. A how-to DVD and illustrated instructions for donning, fitting, and strapping applications. Caution: All TheraTogs systems must be used under the supervision of a clinician to prevent misuse or injury to wearer.